Home Boxing Highlights: Manny Pacquiao Dominates Adrien Broner For A Unanimous Decision Win! 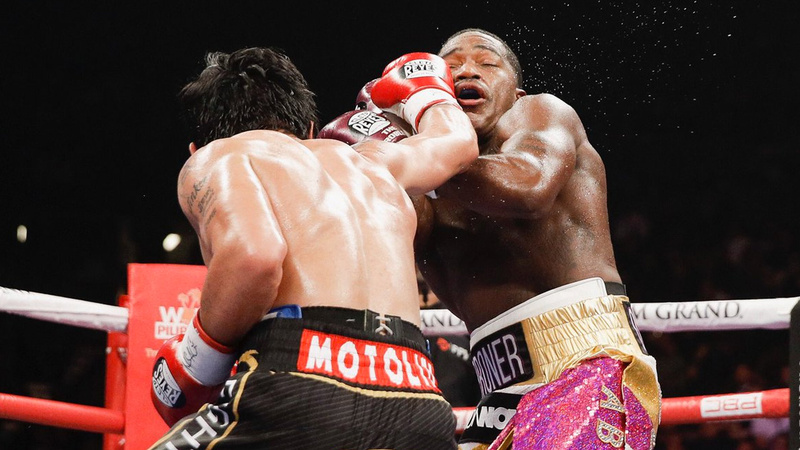 Highlights: Manny Pacquiao Dominates Adrien Broner For A Unanimous Decision Win! Manny Pacquaio Defeats Adrien Broner Via Unanimous Decision And Remains The Champion! Manny “The Pacman” Pacquiao puts his WBA regular Welterweight world title on the line against dangerous former WBA champion Adrien “The Problem” Broner. The match is taking place tonight (Saturday, January 19, 2019) inside MGM Grand Garden Arena in Las Vegas, Nevada. We are underway! Pacquiao trying to keep the distance with a jab, both fighters feint a lot. Pacquiao clinches up, and the referee separates them. Broner attacks with a punch combo and hugs Manny. Quick jab Broner, Pacquiao goes forward, the fighters are clinched up again. Broner looks very patient and throws two punch combo, Pacquiao slips. Good punches from Manny, left-hand hits his rival! Right uppercut Broner. Pacquiao looks more active in this round. Here’s the bell, 10-9 for Manny Pacquiao. Broner goes for a jab, Pacquiao moves like a cat and feints all the time. Sweeping left hook just missed by a hair! Bad luck for Broner. Broner hits Pacquiao’s chin from the clinch, what a great match. Now good right hand by Pacquiao. Broner escapes from the corner, superb movement. Great counter right hand by Broner. The bell signals the end of the round. 10-9 Pacquiao. Broner trying to set up the situation for a mid-section strike. Pacquiao surprises him with the great left hand, and Broner now clinches up. Pacquaio feints again punch to the body. Good jab from “Pacman”, but “The Problem” clinches up. Good pressure by Manny Pacquiao, and another sharp jab. It looks like Adrian Broner has serious problems at the moment, his rival simply dominates. The end of the round, 10-9 Pacquiao. Broner opens up with the jab and lands a fantastic right-hand counter while Pacquiao hits the rival’s mid-section. Left hook Broner. And now another left hook, Pacquiao presses forward, Broner counters with punches. Excellent left uppercut by Manny Pacquiao. Good jab, Broner now slips as Pacquaio goes forward, and Manny “meets” the ropes. Manny hits with a long right hook. Oh, it looks like Broner fights a lot better in this round. The bell sounds. Good round for Broner, no doubt about that. 10-9 Broner. Broner opens up amazingly, and he hits his rival with a great right hand. Oh, what a way to escape the punch, superb movement by Broner! He ducked under Pacquiao’s attack. Pacquaio has problems landing clean shots, and now Broner controls the distance with a great jab. Looping left hand from Pacquiao but it looks like Broner blocked this attempt. Amazing jab from Broner and he hits opponent’s head clean. Left cross miss Pacquiao. Manny attacks with a super-fast combo, but his rival blocks everything. The end of the round, I’d say 10-9 Broner. Great combination Pacquiao, superb left hand to the opponent’s head. And now Pacquiao has Broner on the ropes! Fabulous strike to the mid-section. Pacquiao continues terrorizing rival’s body with amazing hooks and uppercuts. And now a world-class leading right punch, Pacquaio is a lot better in this round. Left straight to the head is blocked, Broner’s body remains wide open. Big hook Broner and the bell sounds. 10-9 Pacquiao. Pacquiao pushes the pace, and he goes forward raining punches. Couple good shots, and now both fighters trading jabs, looking for the perfect distance. Pacquiao is throwing more punches at the moment. Broner is on the ropes again, and Manny attacks to the head and body, how fast this guy is! Broner covers, and tries to clinch up, it looks like he is in big trouble. Manny is looking to finish the fight, he attacks over and over! The end of the round, Broner barely survived. It could be 10-9, or even 10-8 for Pacquiao. Excellent uppercut Broner, fantastic counter. Counter right Broner, and now Pacquiao slips past a big left hook. A superb right hand from Pacquiao breaks Broner’s guard. Counter right Broner, and it looks like it reached opponent’s face. Oh, no, Broner is on the ropes again, Pacquiao tags with a jab. Excellent strike to the body. The round is finished, this one is very tough to score. A nice jab from Broner but Pacquiao delivers a good right hand. And now a right hand and a left hand to the body by “Pacman”. Pacquaio continues to punch rival’s body. Good left hand. Broner goes for a single leg-takedown?! Wait, is this boxing or UFC? I thought takedown attempts are not allowed in boxing! The crowd is not happy with that move. Pacquiao keeps the distance with a jab. Right cross Broner but Pacquaio counters to the mid-section. And now a world-class left hand from Pacquaio and it looks like Broner is staggered! Broner on the ropes again, Pacquiao rains punch after punch, will Adrien survive? Broner with a jab, Pacquaio misses with a strong right hook. I’d say Broner was lucky in this round, 10-9 or 10-8 Pacquiao. It looks like Broner has a serious problem with punch accuracy. Both fighters feinting, tactical game. A good jab from Broner but he stops and pulls back. Pacquiao now moving forward, aiming for the opponent’s mid-section. Now Broner trying to deliver a punch to the body. Broner attempts 1-2 but Pacquaio keeps his hands up and blocks the combo. Counter left punch, Broner. Adrien goes forward but eats a strong right to the chin. The end of the round, I’d say 10-9 Pacquiao. Great 1-2 lands for Broner. It looks like he opened up strong in this round. Pacquiao fires back, and Broner meets him with a jab. Pacquiao delivers a big body shot. Broner keeps his hands up all the time, leaving his mid-section vulnerable. Body shot Pacquiao. Broner can’t hit his rival in this round, Pacquaio’s feints are causing headaches. Great jab from Pacquiao to end the round. 10-9 Pacquiao. It’s the final round. Broner should go for a KO but he lets Pacquaio dance around. Good right cross Adrien. Pacquaio is cut under his left eye but it is not a big deal. Right hook lands for Pacquiao, and Broner evades the left hand. Good jabs from Broner, Pacquiao fires back with a jab too. Manny leads on the scorecards but he pushes the pace. An outstanding combo Pacquiao! Twenty seconds left, and Manny still dominates. The crowd is on their feet. And that’s it, the end of the round. Manny sits on his knees and bows against the corner. I’d say 10-9 Pacquiao. Manny Pacquiao improves his score to 61-7-2, 39 KOs), Adrien Broner drops to 33-4-1, 1 NC, 24 KOs. Manny Pacquiao, Floyd Mayweather Share Awkward Handshake At Lakers Game!